Celebrity Jersey Cards is a regular series in which I create virtual trading cards for jersey-clad celebrities. Today, we continue to work our way alphabetically through Major League Baseball. Born in Chula Vista, CA, Óscar Gutiérrez made a name for himself in wrestling as Rey Mysterio. The high-flyer called his finishing move "the 619," in reference to the area code for San Diego.Mysterio has delighted fans and won titles all over the world. He wore his usual luchador mask for his Celebrity Jersey card. Fellow wrestler Ken Shamrock was born in Warner Robins, GA. He started out as a mixed martial artist before transitioning into pro wrestling. Either way, he was "the world's most dangerous man." I won't criticize the man, but are those casual slacks he is wearing with a jersey? 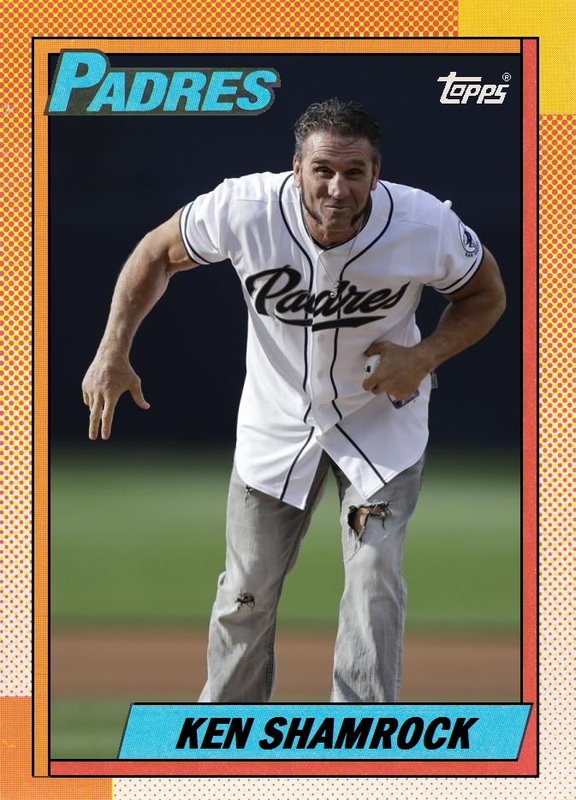 Either way, it makes for an intimidating Celebrity Jersey Card!